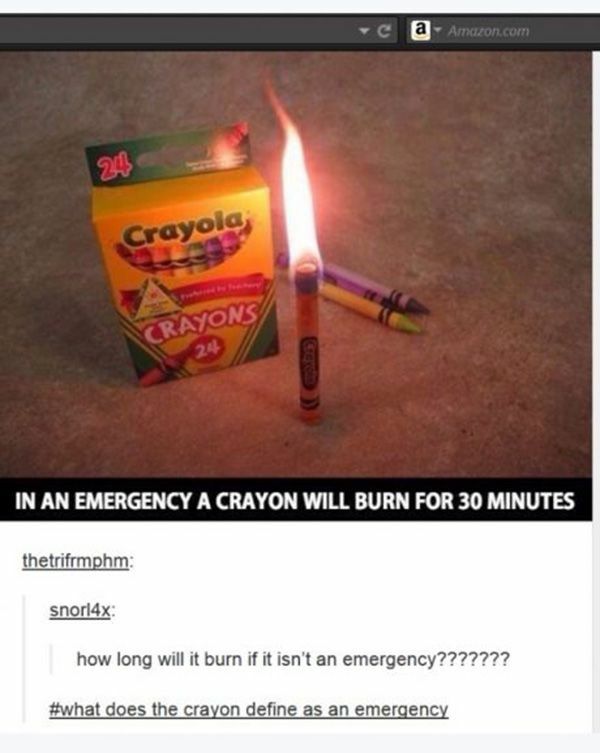 Being set on fire is an emergency, in my book. Does the flame burn in the colour of the crayon? The reason I asked was because the flame in the picture looks darker than most, similar to the wax of the crayon. No, the chemicals in the wax make the flame weaker than that of a flame made from processed oils and gases. Just add some extra ingredients and vola! Orange: calcium chloride, found in household products used for absorbing moisture or dehumidifying. Lime Green: boric acid, which can be found in the pharmacy sections of some stores for use as a disinfectant. Green: copper sulfate, found in products used for killing plant roots. Purple: potassium chloride, which is the main ingredient in non-sodium salt substitutes. You may also wish to put in your note that burning these in a non ventilated area can be EXTREMELY hazardous to your health. Nah, some things children just have to work out for themselves. After 3 or 4 of them succumb to the fumes the remaining ones should clue on. that’s so cool! too bad the kids are too old to have any crayons anymore!